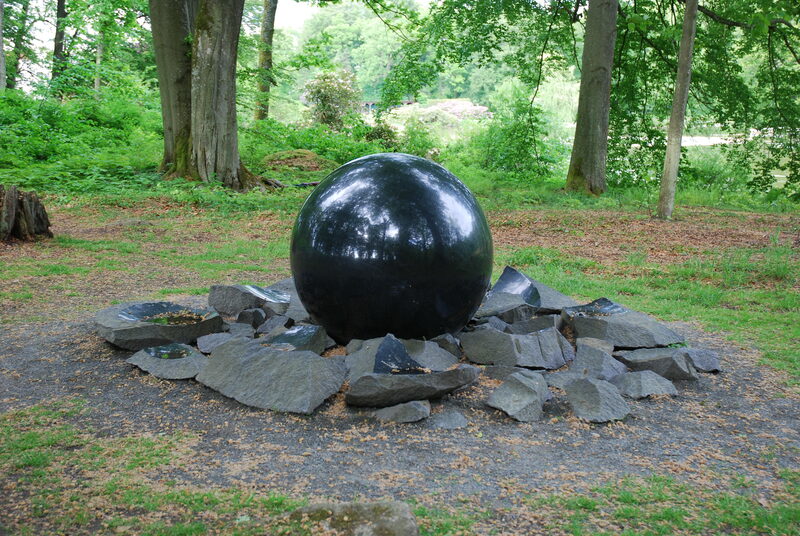 The Earth is constantly being reshaped by the processes of creation, erosion and sedimentation. If looked at world-wide, there are two different types of “land”, usually dependent upon whether or not glaciation has been involved. Scandinavia, Russia, Canada and parts of Africa are vast shields of eroded bedrock whereas the rest of the world is covered by several kilometres of sediments such as the Alps. I thought we’d take a closer look at the process I have chosen to label creation above. Bear in mind that everything in this article is a simplification and that the true processes are vastly more complex than I make out here. The formation of new bedrock is driven by intrusions of magma from below. These can either penetrate to the surface where the relatively speaking rapid cooling results in glassy bodies of cooled lava or if they do not, result in the formation of plutons of usually well-differentiated and crystallised bedrock that the processes of erosion will eventually bring to the surface. A special case is where the intrusions result in secondary mineral formation, metamorphism. When large amounts of magma reach the surface and cools, there has been insufficient time for mineralization. Such rocks are characterised by small, rounded grains of minerals known as phenocrysts, usually feldspars. 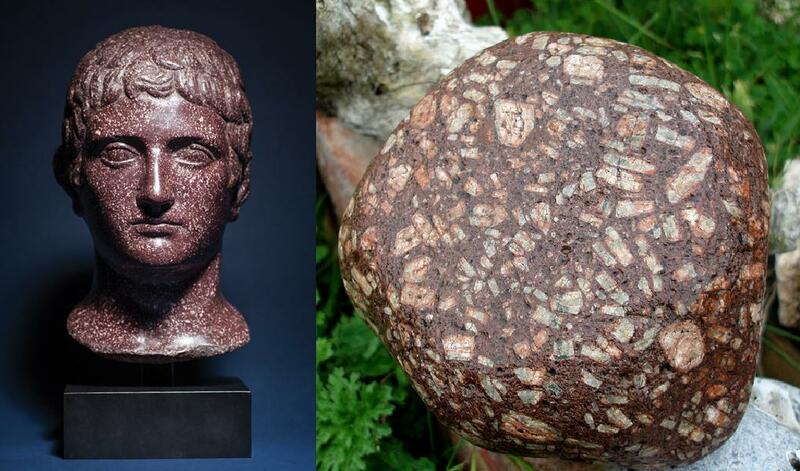 A splendid example of this is the magmatic rock known as porphyry. Phenocrysts vary in size from microscopic, requiring magnifications of 1,000x or more in order to detect, up to several centimetres in size and serve as identification markers or indicators as to the species of magma erupted. Basalt contain phenocrysts of olivine (the magnesium silicates forsterite, fayalite), augite and plagioclase feldspar. Andesites are home to plagioclase, hypersthene and hornblende, Rhyolites contain orthoclase and quartz, Phonolites host nefeline, leucite and aegirine while sanidine feldspar is found in Thrachytes. In the case of a shallow body of cooling and differentiating magma being broached by a fresh intrusion and erupting such as Laacher See (c. 12,900 B.P. ), the crystals ejected yield vital clues to the state of the magma reservoir immediately prior to the intrusion and eruption. Should magma cool in the intrusion dikes, the resulting mineralization is known as Diabase, usually black in colour. The narrower the dike and the closer to the surface the magma is, the quicker it cools which results in very fine-grained, almost glassy diabase. The wider and deeper the dike is, the slower it cools which results in coarser grains and sometimes phenocrysts such as green tablets of plagioclase. When magma does not reach the surface but cools, fractionates, differentiates and mineralises deep underground, we refer to it as Plutonic Mineralisation. The first minerals to crystallise out of such melts are those that require both high temperatures and pressures to remain within the melt. 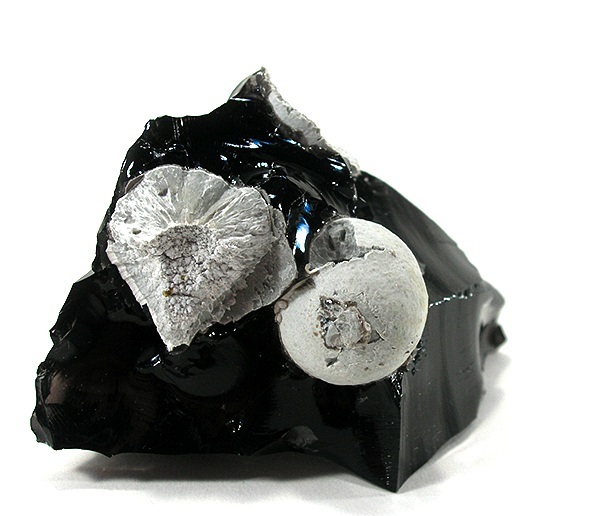 Examples of such minerals are magnetite, ilmenite, pyrrhotite, pyrite and millerite. Because these minerals are heavy, they often conglomerate in certain locations of the body of magma, a process known as differentiation, and may form substantial bodies of ore.
Yosemite National Park, California. 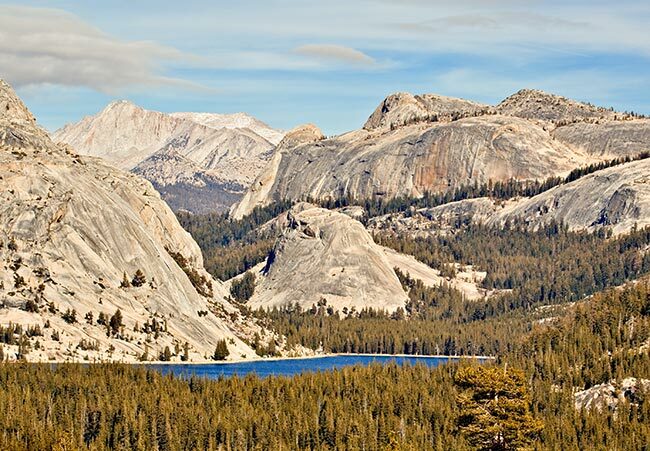 A splendid example of plutonic mineralization of granite revealed by erosion. As the body of magma cools further, the main mineralization processes begin as each mineral reaches the temperature-pressure point where it can no longer remain in solution. The rocks formed at the first stage of this process are the ultramafic and mafic gabbros, peridotites and pyroxenites followed by diorites. The first minerals are alkaline, mafic and ultramafic, such as olivine/olivinite, pyroxenes, alkaline feldspars such as labradorite and anortite and hornblende. These minerals are poor in silicic acid, silica, and their crystallisation makes the remaining magma more acidic. Then follows in order of increasing acidity the muscovites, potassium feldspars and finally granite. To complicate matters, this fractionation requires stable conditions. Should this not be met, the minerals will mix to form only some but not all of the mentioned rocks. Once the main or magmatic mineralisation stage has been completed, there remains a wealth of minerals yet in solution. As the mix continues to cool, they crystallise during the post-magmatic mineralization stage. The remaining minerals are in a hydreous solution of mainly silicates, aluminium, sodium and potassium plus a wealth of other metallic ions that are either too large or too small to have been included into the rocks created by the magmatic mineralization process. 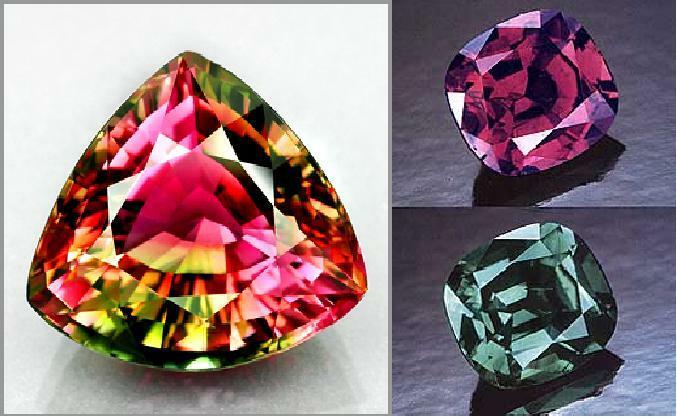 Supreme multi-coloured tourmaline gem, trillion cut, and the exceedingly rare Alexandrite variety of chrysoberyl that changes from green in daylight to red under lamp- or incandescent light. Once the solution drops below about 700 C, the pegmatitic mineralisation stage begins which forms coarse-grained, granitic bodies of rock made up of quartz, potassium feldspar, plagioclase (oligoclase and albite), muscovite and biotite. In these pegmatites, well-developed crystals of rarer minerals such as beryl, chrysoberyl, columbite, fergusonite, euxenite, thalenite, gadolinite, uraninite, orthit, tourmaline and topaz. Yes ladies, we are talking about gems! Once the temperature has fallen to about 550 C, the pegmatitic stage has been completed and the pneumatolytic mineralisation stage begins. This is dominated by certain ore minerals such as molybdenite, cassiterite, wolframite, sheelite, arsenopyrite plus various iron-, copper- and sulphide ores. 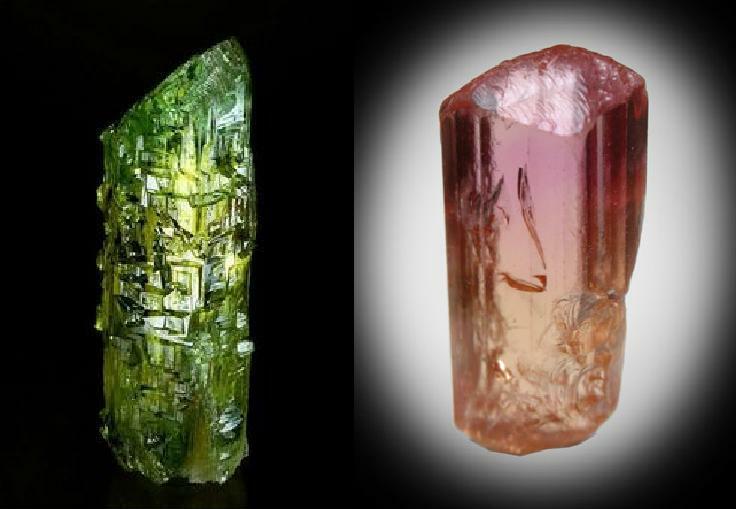 Superb crystal specimens of Beryl (variety Heliodor) and rare pink Topaz. The beryl crystal has been etched by the presence of fluorine in the solution after it had crystallised. The pneumatolytic stage is in turn succeeded by the hydrothermal mineralisation stage. The main body-forming mineral is quartz but bodies of calcite, fluorite, siderite and barite may also occur. If you are rock-mining for gold or silver, such a formation is a good place to begin. Other interesting minerals found here are garnet, tourmaline and topaz in gem quality (300-500 C), gold and pyrite (200-300 C), non-gemstone opal, chalcedony (agate), silver, pyrite, marcasite (50-200 C). 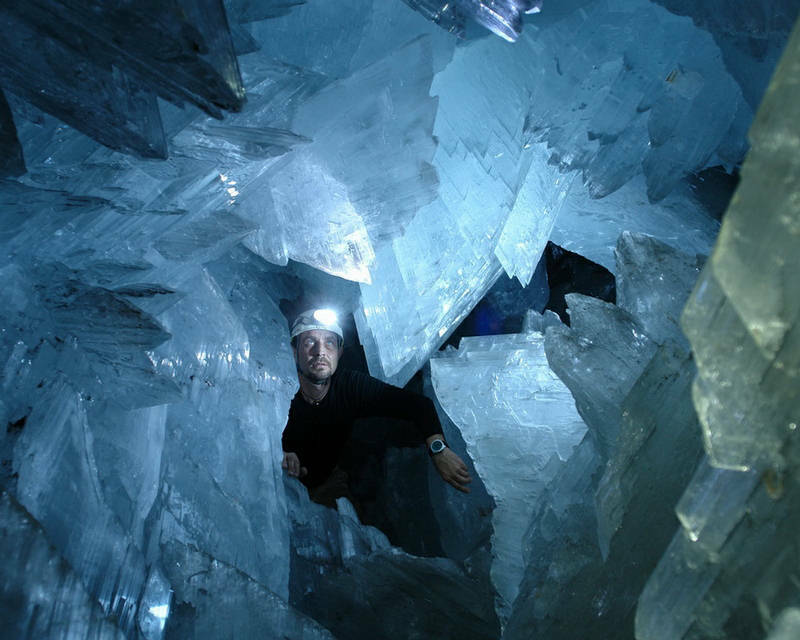 Some of the crystals formed during these stages can reach gigantic proportions. In the Ural Mountains, there is a feldspar quarry established on a single specimen. In Brazil, a beryl crystal weighing in at a massive 200 tons (~75 m^3) has been found and the World’s largest specimen of garnet at 6 m diameter is found near Arendal in Norway. Just to give an idea of how much more complex these mineralization processes really are, let’s take a slightly closer look – but not too close – at one of the most common and simple minerals, silicon dioxide, SiO2 or quartz. There are three mineral varieties of silicon dioxide; Quartz, Tridymite and Cristoballite, each of which has α and β varieties, and sometimes more. 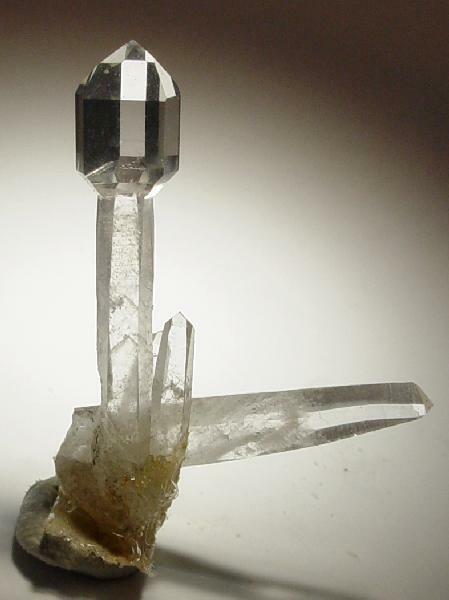 The first to form is Tridymite which begins to crystallise at about 870 C. Now tridymite can crystallise in seven different crystal habits or forms, neither of which is stable as temperature and pressures drop but transforms to Quartz while the crystal shape usually remains that of the original Tridymite. Cristobalite spheres formed via devitrification, loss of silica, from the obsidian matrix (5.9×3.8×3.8 cm) from the Monterey Formation, California, USA (Wiki). Should magma containing Tridymite be re-heated, it may change into β-Cristobalite if the temperature reaches at least 1470 C, but the mineral is only stable above this temperature. If the temperature drops below 250 C at ambient pressure, α-Cristoballite may form. In spite of β-Cristobalite only being stable above 1470 C, the mineral does not automatically revert back to Tridymite (or later to Quartz), because this requires considerable amounts of energy to break the SiO4 tetrahedrons. If Rock Crystal is subjected to radiation, the damage done to the crystal structure causes it to turn brown. This variety is known as Smoky Quartz (sometimes sold as “topaz” which it is not). Since good crystal specimens of Smoky Quartz are more desirable, hence worth more, there is a practice of irradiating it. These irradiated crystals are almost always black in colour and some may retain harmful levels of radiation, depending upon which method is used. Other well-known varieties of quartz include the yellow Citrine and the violet Amethyst which both derive their colour from iron impurities within the crystal lattice. Rose Quartz contains manganese impurities (sometimes titanium or iron is present). But now we have deviated too far from vulcanology via mineralogy into gemology, a favourite subject of mine!